We are just a few hours into Baselworld 2016, and already we’ve seen a few ripples of a trend that may become some sort of horological tide by the end of the week. I’m talking about a growing wave of black watches. Though one particular previously black watch is now available in bronze (the Tudor Heritage Black Bay Bronze Watch, in case you missed our earlier announcement) we’re already seeing darker cases and dials in show windows and as part of debut collections at more than a few watch company appointments we’ve attended. While there’s really nothing exceptionally nouvelle about an all-black case and dial, several of the newest examples feature alternative coatings or metallic bonding processes that will ostensibly last longer (with little if any signs of wear) than traditional blackened PVD treatments. 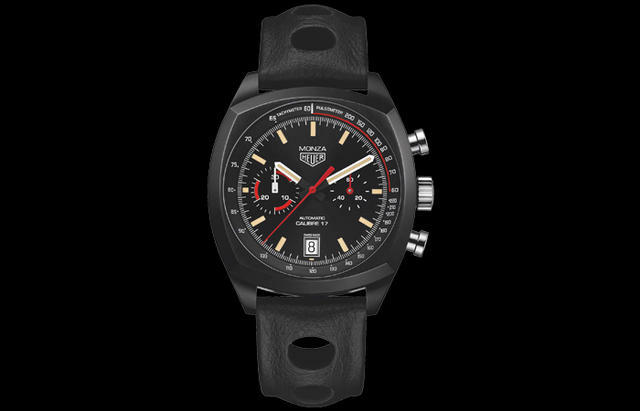 TAG Heuer’s terrific new Heuer Monza Chronograph features a cushion –shaped case plucked from the 1970s, though instead of being made from steel, the case is now titanium that has been coated with black titanium carbide and finished with a matte black surface–to great effect. You will also find titanium carbide darkening the dials and movement components of the brand­’s Carrera Heuer-01 collection, which has now expanded considerably. 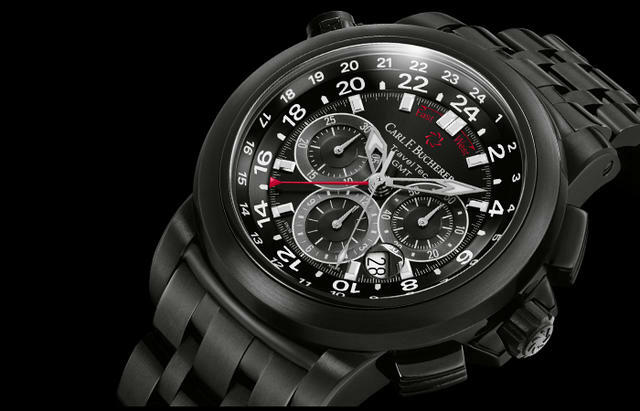 A first-time all-black Carl F. Bucherer Patravi TravelTec this year becomes that brand’s first wholly dark piece. 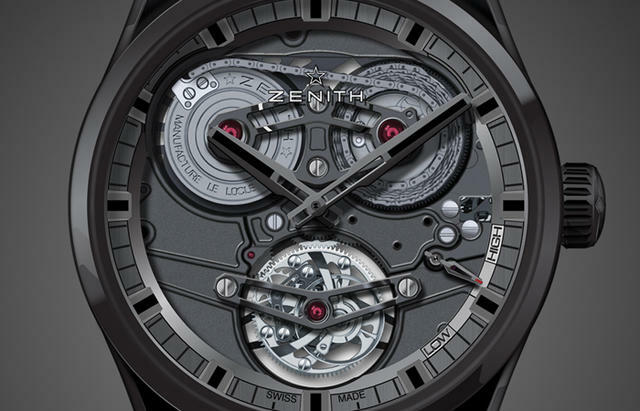 The company explains that the watch’s wafer-thin, diamond-like crystalline carbon structure (a Diamond-Like-Carbon coating) ensures the watch is particularly scratch-resistant. Its rich matte black hue is created by a particular blend of carbon material. While we don’t soon expect to see an all-black model from Patek Philippe, we did spy a few favorites now available with black dials, including the famed Reference 6002 Sky Moon Tourbillon with minute repeater, cathedral chime and perpetual calendar. 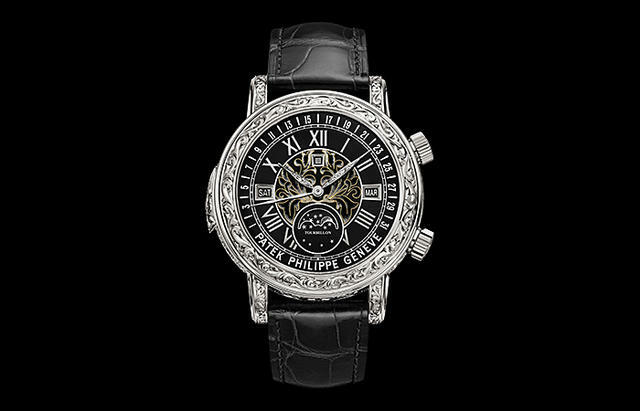 (More about the latest from Patek Philippe later this week.) Just down the hall visitors can spy a continuation of Hublot’s all-black collection originally seen a decade ago, culminating, possibly, with this year’s Big Bang Unico Sapphire All Black, crafted from blocks of sapphire crystal that has been coated with metal. Transparency combined with skeleton work allows the workings of the Hublot Unico manufacture movement to be seen clearly. Even the strap combines transparency with the signature all black style. Finally, two other LVMH family members, Bulgari and Zenith, also showed their dark sides on the first day of Baselworld 2016. Zenith’s 45mm black ceramic Academy Georges Favre-Jacot Tourbillon is a 150-piece limited edition with a clear view of its tourbillon with a rarely seen fusee and chain transmission system. 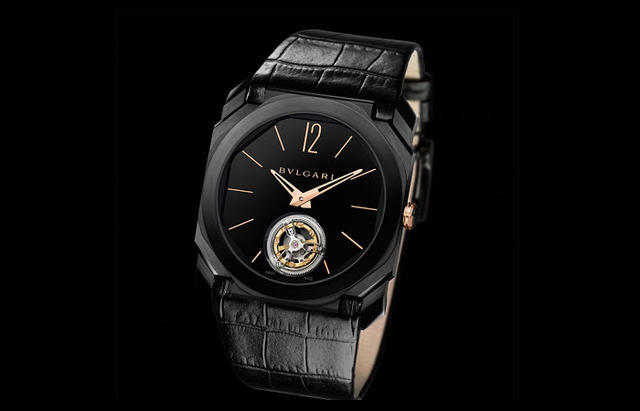 Bulgari reprised its early 2016 preview by displaying the full range of new black Octo Ultranero watches consisting of three models (including an amazing ultrathin Octo Finissimo tourbillon) that all feature black DLC cases on black rubber or leather straps. 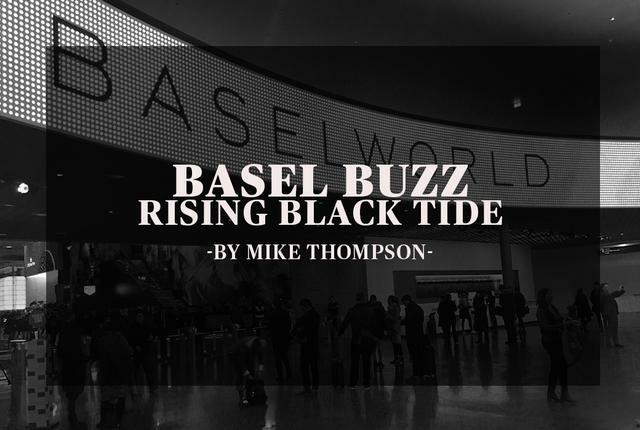 Stay tuned for more Basel Buzz tomorrow and more Baselworld Coverage throughout this week and into next. Want more? Check out iWMagazine.com’s dedicated Baselworld 2016 for debuts, exclusive video and more.